This came about one week night after hosting a soiree of sorts (aka a Golden Globes watch party) the previous weekend. My roommate made the most insane squash toast appetizer, she even made the frickin' baguette. Anyway, turns out we had more squash than toast, so there was a giant bowl of squash in our fridge all week (no complaints here). Since I wasn't about to make homemade baguettes on a Tuesday, we decided it was okay to eat the squash mash out of a bowl as long as we topped it with some greens and beans. It was insanely delicious and so the squash bowl became a winter staple. Seriously, if you ever have a kabocha squash, make it into a squash bowl. But if, like mine, your CSA is really into sweet potatoes, you can easily adapt the squash bowl into the sweet potato bowl, which is what I did last week. And it was so, so good. There's the heat from the chili flakes, the sweetness from the potato and the maple syrup, the bite from the vinegar... plus the earthy warmth from the kale, lentils, and paprika with the freshness of lemon, parsley, and goat cheese. The technique for the mash (in the first link) is Jean-Georges Vongerichten’s and, of course, it's solid. So other than subbing squash for sweet potato and a white onion for a red one, I don't mess with it. We've used kale every time we've made this ('tis the season), but we've used different beans/lentils depending on what we had on hand. I reckon you could add in your protein of choice (although I've yet to test it with meat). Preheat oven to 425F. In a small pan, put the lentils on to cook. 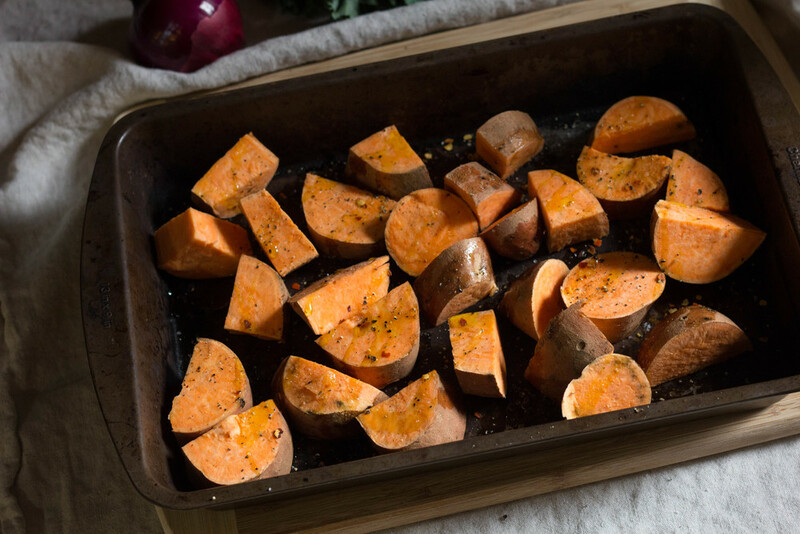 Chop the sweet potatoes into chunks, season with olive oil, chili flakes, salt and pepper and roast in the oven for 30 - 45 minutes (until soft enough to easily mash). While the sweet potatoes roast, slice the onion and sauté in a large pan on a medium heat. Roughly chop and rinse the kale. Remove cooked lentils from the heat and set aside. Once the onions are caramelized (about 30 mins), deglaze the pan with apple cider vinegar and maple syrup. Add the sweet potatoes to the onion jam and mash everything together. Remove from the heat and season to taste. Put the kale on to cook (I use the same pan I cooked the lentils in). Once the kale has started to reduce, add the lentils, lemon juice, and paprika to the pan. Stir and season to taste. To assemble, put the sweet potato mash in a bowl, top with the lentil mix, and sprinkle with crumbled goat cheese and roughly chopped parsley.